Congratulations! You are wonderful and you are here! Life is winning today in 600 places in Romania and Moldova! The feeling I have here in front of you is gratitude. I am looking at you with such a great joy! Thanks to you, today we are hundreds of thousands of voices saying, “Yes, I am grateful for the gift of life! Yes, we stand alongside the women in pregnancy crisis! 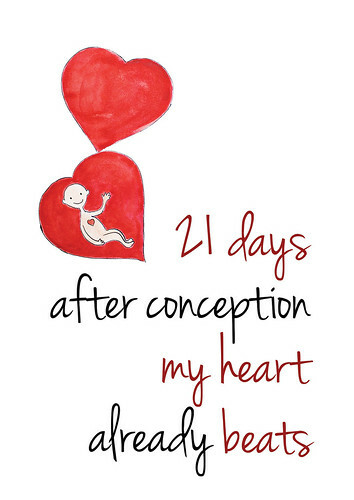 “Thanks to you, today we are hundreds of thousands of hearts beating for the life of unborn children, for the life of the most innocent, most gentle little men on this earth. Thanks to you, today we are hundreds of thousands of arms that will stretch out to help those in need of support, to protect them when the storm of worries and doubts come upon them. Besides the feeling of gratitude to God and to my parents for giving me life, I am glad to say YES to life as a student of Faculty of Medicine. Science is next to us at every step, every time we protect the unborn babies. Isn’t the beating of the heart the most soothing sound for us, doctors? This sound starts with the day 16 and is the one that brings the smile on the mother’s lips and tranquility inside her soul: “Yes, my baby is fine, he is in my womb and feels protected.” Isn’t this the greatest thing that anyone can do to protect the small and helpless one? Do you know what other wonderful things the doctors know? They know that at 8 weeks all organs are formed, they are still very small – but who doesn’t like the little and delicate things? They know that at 12 weeks, the baby can move his hands and legs and can smile! It’s incredible, and more incredible is that we were so small too and someone has protected us! Someone told our mother: Don’t worry, everything will be fine. I’m with you! What an extraordinary story! It is the story of each of us who enjoys life today and can offer life further. And these stories meet today here, coming from different roads, but all with the same desire: to support life. No matter how many things we seek on this earth, it is the truth and the love that will save us. The truth is that an unborn child is a man and the love we show to the women in pregnancy, helps them to give birth. The truth is that along with the good that we do to them, we cure ourselves of loneliness, indifference and cynicism, because supporting and showing love means fulfilling your purpose of man. Let’s be human, by supporting humans! There is a lot, a lot of need! I was always impressed upon women in pregnancy crisis I have talked with, by their great need to talk to someone, to open up to someone, to hang on one’s shoulder and to hear at least once: You are not alone, I am here of you and there is help. That’s why every year we appeal that society, that is us !, to create a variety of tools to support a woman in pregnancy, such as setting up support centers for pregnant women, creating the legal possibility that a pregnant woman who believes she can not raise her baby to take him for adoption immediately after birth, started during the pregnancy period that is used in the US, UK, Australia; giving value inside the society, to all those involved in adoption. There is much to be done, every human being is unique and can have his own contribution to a culture of life, to a pro-life Romania!